Triglycerides are esterified fatty oils that form the core of chylomicrons and VLDL cholesterol. Elevated blood levels of triglycerides, but not cholesterol, have been associated with an impaired fibrinolytic system and is an independent risk factor for cardiovascular disease. 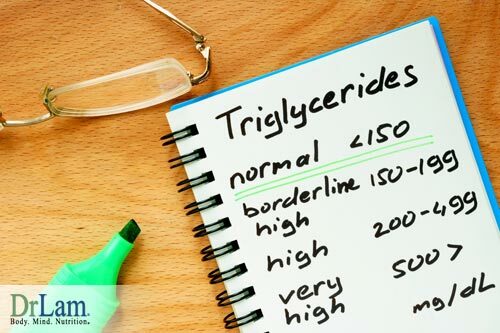 This risk can be decreased when you lower triglycerides naturally. Triglycerides and cholesterol both measure the total amount of lipoproteins in the serum, which can be a rough indicator of risk for cardiovascular disease. The associated cardiovascular disease risk prediction offered by triglycerides and cholesterol by themselves is 44 %, but when coupled with Vitamin A and E, looking at the ratio of (cholesterol + triglycerides)/ (Vitamin A & E), the risk predictive power goes to 85% accuracy. Elevated serum triglycerides have been associated with the occurrence of atherothrombotic stroke and transient ischemic attacks. It is a powerful predictor of myocardial infarction. A diet high in saturated fats and sugar (including grains) can raise serum triglycerides. While a normal triglyceride laboratory can be up to 200 mg/dl, the appropriate goal for anyone serious about optimum health should target their triglyceride to be no higher than 100 mg/dl. A triglyceride count of 100 or more increased the relative risk of a new cardiovascular event by 50% and reduced the chance of surviving a subsequent heart attack. Since triglyceride elevation is almost universally related to dietary intake of sugar (including grains), high triglycerides are one of the easiest and straightforward problems to correct with proper diet alone. The decline is dramatic and in a matter of weeks if you lower triglycerides naturally. Start with eliminating all grain products from your evening meal. This includes wheat, rye, barley, potato, bread, and rice. You may find it difficult in the beginning and experience cravings. This is quite common because your body is already addicted after years of taking in grains. By starting with just your evening meal, you can cut approximately 30% of your total grain intake while still being able to ease your body into it. Do this for at least 60 days. As your body slowly gets used to the reduced grains intake, you can then also reduce grains intake at lunch. Substitute with more above-the ground-vegetables, eggs (raw is best, and try not to cook the yolk too well), and unroasted nuts. Oils are acceptable as long as they have not been exposed to high heat. Use virgin olive oil for salads and light stir fry, butter for high heat frying, and coconut oil for deep frying (which should be kept to a minimum). As usual, no desserts after dinner, and reduce snacks before bedtime. All refined carbohydrates such as cookies, ice cream, and chips should be avoided. Follow the above, and you will be surprised how quickly the triglycerides come down. As the triglycerides normalize, the total cholesterol will reduce automatically, and the total cholesterol to HDL cholesterol ratio will automatically improve. The human body knows what nutrition it needs to achieve and maintain optimum health. When this nutrition is not obtained and the body is affected negatively, such as high triglycerides or blood sugar abnormalities, the body becomes stressed. The body uses the NeuroEndoMetabolic (NEM) Stress ResponseSM system to combat stress from poor diet, lack of exercise, mental stressors, environmental toxins and other stress in life. This constant bombardment of stressors causes the adrenal glands to work overtime. The adrenal glands are two, small endocrine glands that are located above the kidneys. During stressful situations, the adrenal glands must produce cortisol, the stress hormone, to deal with the current stressor. Cortisol is the “fight-or-flight” hormone. The body produces cortisol to increase on demand energy, mental acuity, and other survival responses. This response comes at a cost however to other body functions that are not essential for survival. 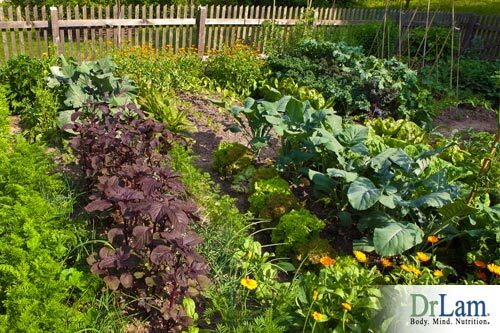 The poor diet leads to nutrient deficiencies and digestive distress. The body’s immune system weakens and hormonal imbalances develop. Over time symptoms arise, fatigue, lethargy, brain fog, irritability, weight gain and inability to lose weight, allergies, and anxiousness, which signal the adrenal glands are severely overloaded. Adrenal Fatigue Syndrome is the clinical term for this state of adrenal disruption. To treat Adrenal Fatigue Syndrome and lower triglycerides naturally, lifestyle changes are essential. Following the Adrenal Fatigue Treatment is key to obtaining optimal nutrition for your body to begin rebuilding the body and repairing the adrenal and cardiovascular system. Find new ways to manage mental stress and developing a positive outlook on life will greatly improve health and the symptoms of Adrenal Fatigue. Daily exercise is highly recommended to lower triglycerides naturally and recover from Adrenal Fatigue. For AFS sufferers, exercise should be approached with caution. Starting with short, light paced walks or light yoga is best to prevent adrenal crashes.